The weather in Mexico when we arrived was so hot Patsy and I were both miserable. Our first real reprieve from the heat was only a 5-minute taxi ride and a short ferry to Isla Mujeres, the Island of Women. 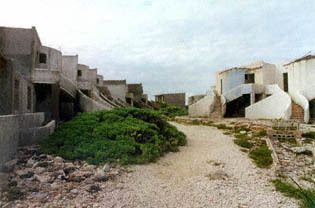 On the northeast tip of the island we found a long-abandoned hotel named El Presidenté. Once a grand hotel on one of the most beautiful places on earth, now laid waste by hurricane Gilbert which struck the region in September 1988. A caution. Though Patsy and I sensed no danger here, this area was abandoned, and extreme caution should always be taken before venturing into unknown territory without a guide or resident of the area. 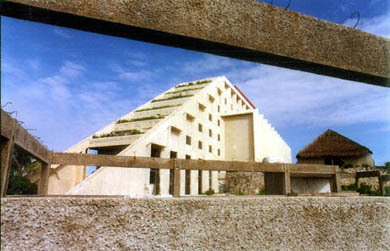 Just east of north beach is the abandoned hotel known as El Presidenté. 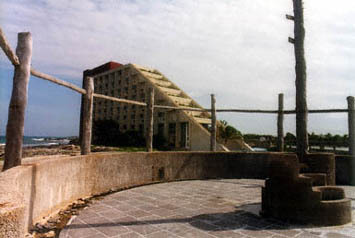 The main structure looks east, hanging on the edge of the Caribbean. The next dry land is known as Cuba. An exquisite setting in a land of beauty. 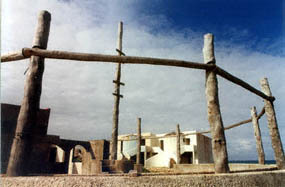 This structure, left, which was just a short walk from the main hotel, made me think I was in the land of the Pueblo, Navajo and the Hopi. Except it was within 30 feet of the sea, off the northeast tip of the Yucatan Peninsula. Just past the structure above we saw what appears to be a village, a community of stone, concrete and symmetry, in a spectacular location. I assume this area was part of the hotel complex, perhaps bungalows.